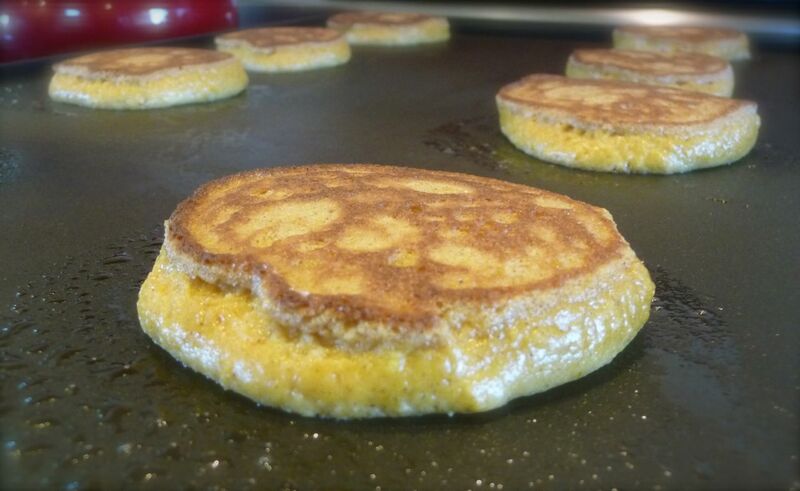 I’m quite a pumpkin aficionado, so developing an almond flour pumpkin pancake was on the top of my “to-do” list for Fall! And thankfully, this recipe was fairly easy to create, because I simply used my delicious Fluffy Little Almond Flour Pancake recipe as the base. 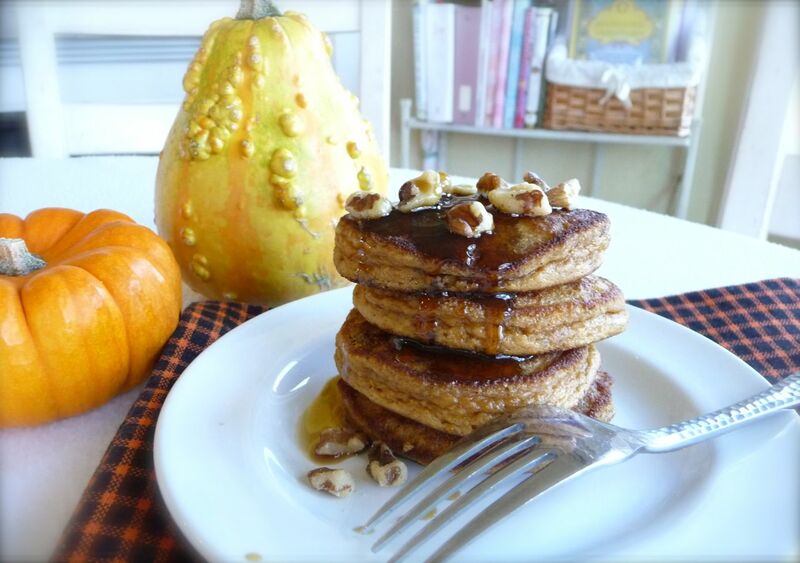 The result is a moist, fluffy pancake that truly captures the flavors and aroma of Fall! Keeping the pancakes small (about 3″ in diameter) makes it easier to flip them and also helps them cook-up nice and fluffy! By the way, you don’t have to be gluten-free or grain-free to enjoy the benefits of blanched almond flour. Whether your GF or not, adding it to your diet is a healthy way to add variety and satisfy those carb-cravings without sacrificing good nutrition. That’s because blanched almond flour is low in carbs, high in protein and fiber, and provides many essential vitamins and minerals, as well as healthy fats. Place all of the liquid ingredients into your blender, then place all of the dry ingredients on top. Cover and blend on low to start, then increase to high and blend at least 1 full minute. Please note: The batter will be very thick like a thick cake batter. If it is too thick for your liking, a simple option to correct the consistency is to simply add a tablespoon of coconut milk to the batter one tablespoon at a time, blending thoroughly before adding another tablespoon, until the desired consistency of batter is reached. Adding extra milk may make the pancakes a bit thinner (depending upon how much extra milk is added), but it should not dramatically impact the flavor. Original Instructions for Preparing: For those who would like to follow the original instructions, I've left them intact below. Place the egg yolks in a large bowl and whisk in the pumpkin puree and melted butter. Next, whisk in the maple syrup, vanilla and pumpkin pie spice. Carefully flip and cook another few minutes until done. Serve hot off the griddle with cultured butter, crispy walnuts and a drizzle of pure maple syrup. Happy Fall! These look really good…I love pumpkin recipes! I have been searching for a pancake recipe and THIS is THE one! Thank you! It’s everything we can eat in our home…. These look great, we’ll be making them this morning! 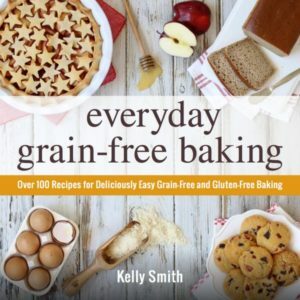 Where do you weigh in on whether or not almond flour needs to be soaked? Making my own from soaked nuts is not really feasible… I’ve heard some with the opinion that if the almond flour is blanched it has way less anti-nutrients… but I’ve read other information that is different. I’m out of blanched almond meal and was wondering if you thought garbanzo flour would work. Thank you for such a quick reply :). I am going to make these tomorrow! I’m wondering whether I did something wrong because we thought these tasted just like your regular almond flour pancakes (which we do like!). In fact, when I commented to my husband that they need more pumpkin, he asked, “These are pumpkin?” Is it really just 1/3 cup of pure pumpkin puree? Do you think we’d need to make any other adjustments if we double (or even triple) the pumpkin? Made these tonight and they were delicious! I love the process of using the blender and I also added a handful of Enjoy Life chocolate chips! Thank you!